If you live in an old home, you know that it has its ups and downs. Preserving the rich history of the decades past can be fun, but living with some of the old design choices can be less than thrilling. The maze of hallways, oddly shaped rooms, and years worth of dust are just a few of the obstacles you’ll face. While some of these idiosyncrasies can’t really be fixed, making updates to individual rooms can help to update the space. Let’s start with the bathroom. When you think of transforming your bathroom, you probably think of completely gutting it and starting over right? This can be a lengthy, costly process that will leave your bathroom in shambles for weeks. So before you start tearing your bathroom apart, ripping out the tiles and ordering new appliances, there are other options. 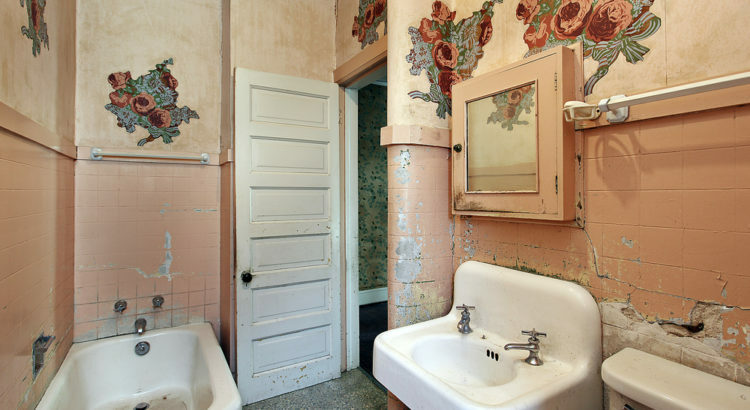 Almost every old bathroom features those bright-colored tiles, reminding you of your great-grandmother’s house. Yellow, peach, teal… who thought those were a good idea? Well, if you’re still lucky enough to be living with them 50 years later, the good news is, you’re not stuck. Tile Reglazing is a great alternative to replacement, especially if the tiles are still in good shape, aside from their horrendous coloring. After a deep cleaning of the bathroom, a professional will come in a spray a very thin layer of enamel across the tile, transforming them in a matter of hours. In addition to the bright colored tiles, there’s probably some unwanted coloring happening in your bathtub and sink. If they’ve aged to be a dingy yellow, not only is it unattractive to look at, but it probably doesn’t leave you feeling as clean as you’d like after a tub. Refinishing can make a cracked, chipped, dirty bathtub or sink look good as new. Now that you’ve taken care of the colored tiles that were impossible to match, you can add your own splash of color on the walls. Perhaps this time, though, choosing a timeless neutral color that will look good for years to come. After taking care of all the logistics, now it’s time to have some fun with decorating! Add your own personal touches with artwork, decorative shower curtains, and maybe even an antique mirror to still keep that “old house” feel. Whatever your style, the options are now endless with your newly remodeled bathroom! If you’re ready to transform your old bathroom, Eastern Refinishing is here to help! Contact us to learn more about tile, bathtub and sink refinishing. Now servicing New Jersey, Columbus OH, Boston MA, and other areas. Check out our locations page to see where else we work!